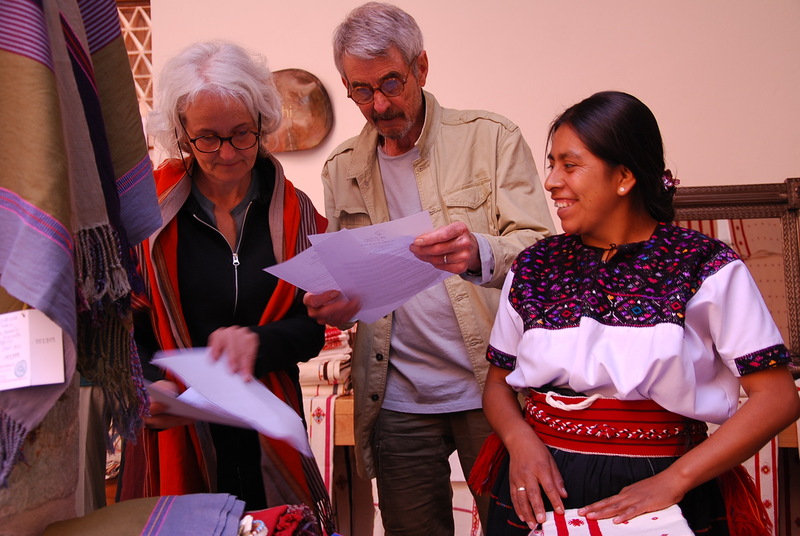 The non-profit association El Camino de Los Altos was established in Mexico as a result of a twelve-year collaboration between Mayan weavers in Chiapas and the French non-profit group El Camino, made up of eight professional designers all working voluntarily together to create a high quality collection. El Camino de Los Altos recently held an exhibit and sale at the Museo Textil de Oaxaca, and I was fortunate enough to be in town that weekend at the start of the opening day. 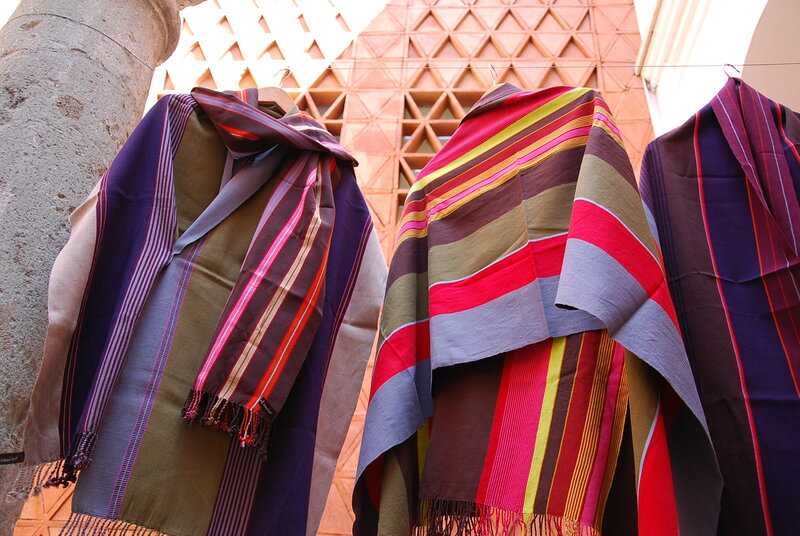 The group is composed of 150 indigenous weavers from five different municipalities in Los Altos de Chiapas. 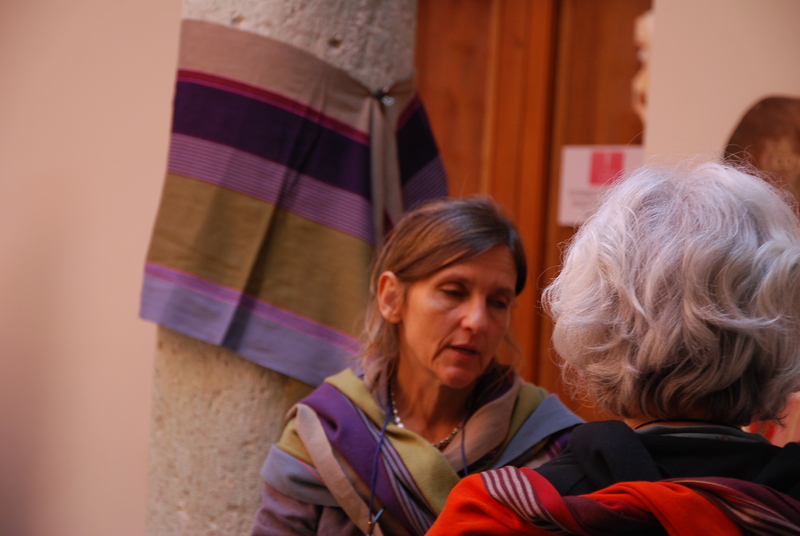 The aim of the partnership is to improve the living conditions of the weavers and their families, to contribute to the long-term survival of an outstanding ancestral art, and to provide the women weavers, who have been learning textile design for twelve years, the opportunity to grow professionally both as weavers and designers. To accomplish these goals, the association has established a new training center where the weavers meet and exchange ideas with designers, artists, and others interested in promoting the collection. The designs combine bold, contemporary colors and motifs with ancient techniques and iconography. the materials used are of the highest quality cotton. The members of El Camino de Los Altos are also learning to manage and administer the association and market their products internationally. 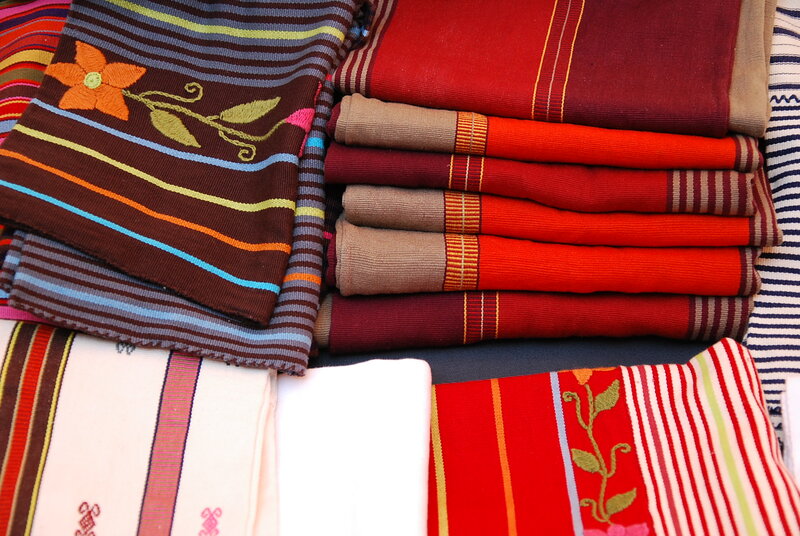 The association continues to seek financial support in order to promote and market the beautiful textiles. The collection focuses on interior design, bed linens and accessories, in additional to shawls, table coverings, scarves, handbags and shoulder bags, pillow covers, and bed spreads. I loved the small, intricately hand-embroidered baby bibs that were on display alongside adult sized garments. 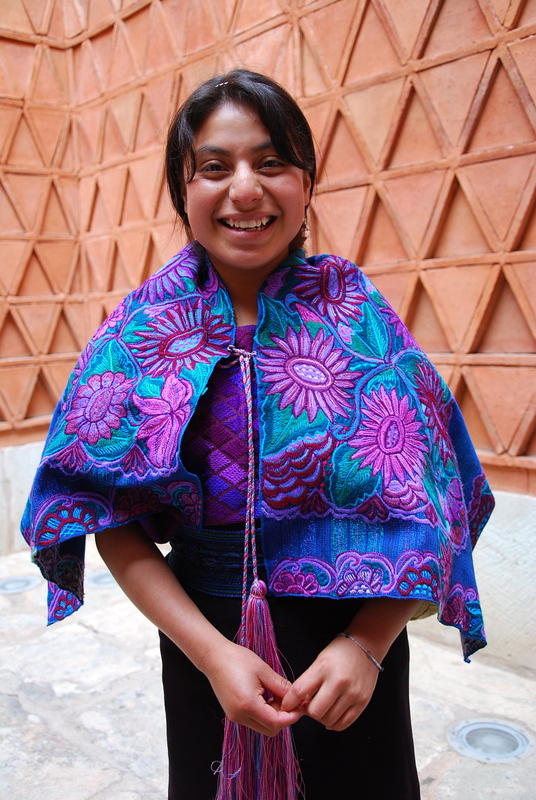 Most of the textiles are woven on pre-Hispanic backstrap looms using mercerized cotton yearn or sheep wool and dyed with natural dyes. The association includes the follow municipalities: Chamula, Larrainzar, Oxchuc, Pantelho, and Zinacantan. Creative Writing Instructor for Women’s Retreat: Applications Are Now CLOSED. Applications are now CLOSED. We have had an overwhelming response; thirty-five talented writers, poets and teachers applied to lead the Winter 2011 Oaxaca Women’s Writing Retreat. We received applications from writers and poets in San Francisco, Minnesota, Atlanta, and throughout North Carolina, from the mountains to the sea. A review panel is meeting on Thursday, May 27, to read the applications and recommend three final candidates to talk with personally about how they would approach leading the workshop. We should have an announcement by mid-June at the latest. Then, we will publish the workshop program and begin to take registrations. There are already four people on the wait list — waiting to register once we have dates and a cost. The people who applied for this position are extraordinary. Some have been nominated for the Pushcart Prize, many have been published in major literary magazines, several teach in university English and creative writing programs, others have written and published books of memoir, poetry and fiction. I am humbled and honored to have read their resumes and their many accomplishments. Seeking to engage a published creative writer and veteran instructor to lead a creative writing workshop that will employ journal, memoir and poetry as genres for self-expression as part of a women’s retreat to be held in Oaxaca, Mexico, in winter 2011. Month and date is negotiable. Applicants must have experience facilitating writing workshops for adults. Excellent verbal communications skills and ability to work with, nurture and meet the needs of individual adult participants who may range from having little or no experience to those who may be facile with the genres is expected. An MFA is a plus, though not essential. The retreat, which will be limited to 8-10 participants, focuses on self-expression and reflection in a relaxing environment; it is not designed to prepare people to publish their work or to be approached with academic rigor. The focus is NOT on new age healing, spirituality or therapeutic intervention. The women’s retreat is in the planning stages and will include approximately five days and six nights in residence over a long weekend in the Zapotec weaving village of Teotitlan del Valle in either January, February or early March 2011. 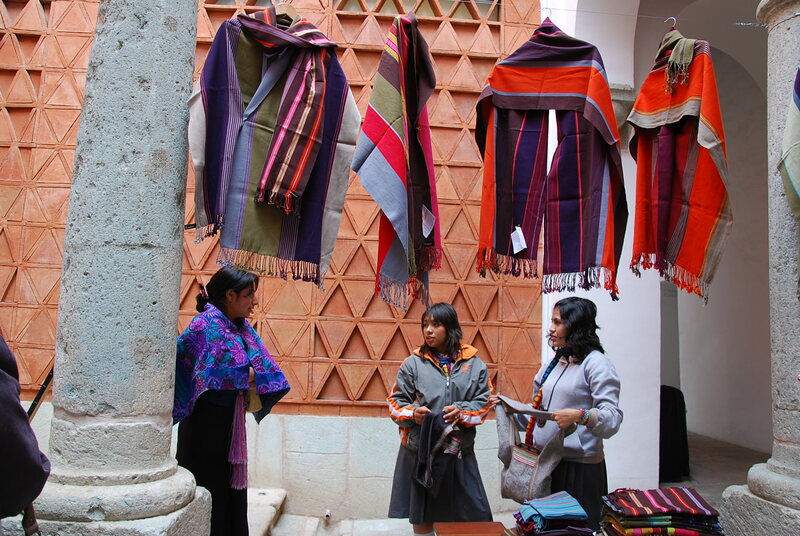 It will be held at a lovely bed and breakfast and weaving household operated by three generations of Zapotec women. In addition to the writing workshop sessions, we will be including yoga and body movement, traditional temezcal sweat lodge, shiatsu massage, visits to artisans’ workshops and local markets, bird watching, and countryside walks. Compensation will include air travel, food and lodging, plus a modest stipend. email: normahawthorne@mac.com Applications will be considered through May 10, 2010. Hi Norma, I hope you don’t mind me bothering you again and asking this, but I’m having no luck getting a reply from anyone else in Mexico and finding mixed advise on the internet. Can you tell me what the weather is likely to be doing in Oaxaca in Jjuly? i know its the summér rainy season, but does it actually rain all the time? is it extremely hot and humid? We have found a lovely beach hut we would like to rent but i’m worried the babies might find the heat too much as it doesnt have any air conditioning etc. We have to come in July, but we dont want to sit on the beach in the rain all holiday. i have heard the Baha peninsular gets less rain but we really want to see oaxaca and the old mexico. Any advice you might wish to impart would be much appreciated! It is hot and humid on the coast of Oaxaca in July. late afternoon, usually and predictably around 3-5 p.m.
had only a fan. It was quite comfortable. sun is strong, like Australia. Make your plans and go and enjoy yourselves.